Today, I was sitting in the infusion center at McKee Hospital receiving some IV drug therapy when I notice the email announcement of the passing of Bill Armstrong, President of Colorado Christian University and former U.S. Senator. This is a great loss for his family, CCU and the State of Colorado. It is in reflection of his life and legacy that I share these thoughts and observations. In the Old Testament a “drink offering” of a portion of wine, was mingled with sacrifices on the altar. Some have concluded that this is a picture of recognition that, “all blessings comes from God.” The picture I think of is when David’s three mighty men risked their lives to enter into enemy territory in Bethlehem. David was fleeing from Saul and longed for a drink of water from the well of Bethlehem. When the men returned with the water, David poured it on the ground as a sacrifice. (2 Samuel 23:16) This was an act of surrender. He recognized the bravery of his men, over the thirst and desire of his own life. Paul’s life had been lived as the “living sacrifice” that he called the Romans to be. (Romans 12:1,2) Paul’s life had already been “spent” not in selfish pursuits, but in surrender to the work of Christ. When you live a “poured out life” fighting the fight, running the race and keeping the faith will become a natural consequence of that commitment. When all that we are given, is given to all that God calls us to be, it results in receiving all that God has provided for those who love and obey and serve Him. In this life and for all eternity that is to come. I write this in honor of Former U.S. Senator Bill Armstrong, President of Colorado Christian University. He passed into the ranks of heaven on July 5, 2016. He was certainly a, “man among men” and a “leader among leaders.” I can’t say that I knew him well, but was counted as a friend and one he supported not only during my legislative years but as one who was “all in” during my health crisis. He was generous in his support and loyal in his prayers. He mentioned on a number of occasions how he would give updates and have his executive leadership pray for me. I was viewing a video tribute to President Armstrong and his board members shared how he would have communion at all the board meetings and they would end the meeting kneeling in prayer at their chairs. It is no wonder that the Lord blessed the University with academic achievement and spiritual vitality during his ten years of leadership. I recall having a breakfast with President Armstrong on one occasion. He told me that he really wasn’t planning on taking on any more significant tasks in his life when offered the position of President at CCU. He did so because he felt that was God’s calling. As he took on the task, he did so as a “drink offering” before the Lord. He gave himself completely to the task in a sacrificial manner. 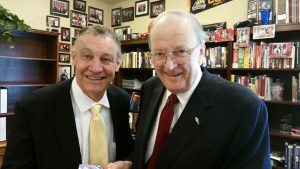 When I heard that his cancer was active and threatening his life, I made plans to drop off a copy of my book at his office. He had read the manuscript, expressed how much he enjoyed the read and wrote a nice endorsement. I was surprised that he was in his office and even more surprised that he took time for conversation, concluding with a time of prayer. Bill Armstrong was a leader, he was a true man of God and an example for others to follow. His impact on lives is “deep and long.” I count myself privileged to be among those who knew him a little, but admired him much. He has inspired me to live a “poured out life” to continue to fight a good fight, run the race and keep to keep the faith! An honorable man, a man of integrity, a Godly man. Senator Armstrong owned a Denver radio station at which I worked, and I was proud to work under the leadership of this man whose life, in my opinion, spoke louder than his words. Ken , what a great tribute. I am still with you as you continue to recover it amazing how well you are doing. I live in Kentucky but you are and inspiration to me even though I knew you little I have admired you from afar fighting the good fight. Thank you for all you do and have done it has made a difference in my life … Funny how you think the smallest things that we may do are huge to others isn’t it ! It’s true I hope I too am leaving bits no small pieces of myself in all that I meet . Be Well ! !